John R. Graham was appointed Regional Director, Region 10, on April 1, 2018. 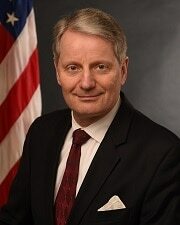 He previously served as Acting Assistant Secretary for Planning and Evaluation during the Administration’s first year. He has almost two decades experience as a financial, economic, and policy analyst in the health sector. Working at a number of well-known non-profit research institutes, Graham has led research on topics including payment reform, regulation of drugs and medical devices, health information technology, and comparing international health systems. His research was influential in both Congress and state capitols, where he was frequently invited to testify on health policy. His short articles on health policy have appeared in media including the Wall Street Journal, Washington Post, and Forbes, where he contributed a regular column until joining the Administration in March 2017. Graham also served as Vice-President for Policy of AdvaMed, the Advanced Medical Technology Association. Previous careers included serving on the institutional sales and trading teams of investment banks, including Goldman Sachs, in Frankfurt, Germany and London, England; as well as Army infantry platoon leader and military parachutist. Graham received his M.B.A. from the London Business School and his B.A. (with Honours) in Economics & Commerce from the Royal Military College of Canada. He is a Chartered Alternative Investment Analyst (CAIA Charterholder) and is an affiliate member of the CFA Society of Seattle, having completed all three levels of the CFA (Chartered Financial Analyst) program.